When creating the Dogwoods, we wanted to create an atmosphere for your pets that truly felt like home. I spent numerous hours thinking long and hard about the many things that a dog may experience in their normal day to day lives with their owners. 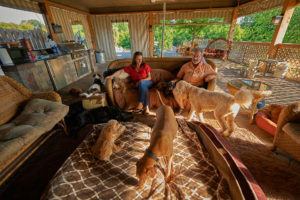 Ultimately, I knew that in order to separate ourselves from the pack our home would need to be more than just about having a fun place for the dogs to play or that we “looked” like a home. I knew that it also needed to “feel” like home for both the guests and their owners. Through this realization I saw that the biggest piece missing from an animals routine when they visit a boarding facility is their human’s companionship in the evening. It was then that I began making movie night a regular part of the boarding routine here at the Dogwoods. Of course it wasn’t hard to get behind because most of our guests are just so stinking cute that I wanted to just cuddle them all. Think about it. After a long day of work you head for home, looking forward to that opportunity to unwind. Maybe it occurs when you first pick your pet up from dog daycare, but none the less there is always that excitement your pup rewards you with the moment you cross the threshold. From that point forward the evening is usually filled with some routine similar to: playtime, dinner time, a short walk and last but not least some snuggle time on the couch for you and your furry friend. During this time there is a connection that is formed between you and your pet; particularly while relaxing and watching the evening news or dare I say “The Tonight Show with Jimmy Fallon”. To your pet, this time connecting signifies that it is ok to be relaxed and at ease. We also believe that by providing movie time it also helps us to signify the end of the day similar to what they are used to at home. Every night from 7-10PM, depending on the weather, we either gather in the camp house to enjoy the sunset and a movie or we head to the home theater room to watch TV. This affords our nannies the opportunity to build that human companionship similar to what your K9 is used to and it provides them the mental comfort to insure a peaceful slumber throughout the night. To be truthful, I really think this connection also helps the nannies too! Of course at the end of the night we have our last potty call and by this time no one objects to bedtime, as many of our guests know that tomorrow begins early (5AM) and with the new day, new adventures await at the Dogwoods. We truly look to provide as many of the amenities your pet may enjoy at home and we enjoy building that relationship with your pet. 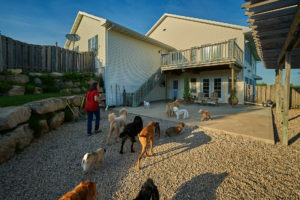 If you are interested in learning more about dog boarding at The Dogwoods or want to schedule a reservation, please follow the included links or browse our site to learn more about the many perks of our Home-style Facility.